Three Americans who were detained in North Korea were freed and are traveling to the United States with Secretary of State Mike Pompeo, President Donald Trump announced Wednesday. "I am pleased to report that Secretary of State Mike Pompeo is traveling and returning from North Korea with the three wonderful gentlemen that everyone wants to see, they seem to be in good condition," Trump said in his Twitter account. The president said that they will land in the early hours of Wednesday through Thursday at Andrews air base, outside of Washington, and that he will be there "to greet them." The three Americans were accused of espionage or "hostile acts" against the North Korean regime and were being held as prisoners of war. 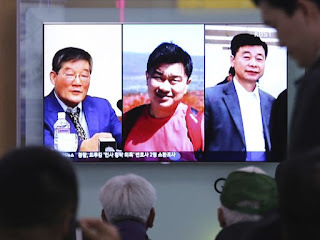 The three prisoners are Kim Dong-chul, 64; Kim Sang-duk, 58, and Kim Hak-song, who is around 60, all born in South Korea and who later acquired the American nationality. The news is known only hours after it was known that Pompeo visited Pyongyang, for the second time in less than a month, in the latest movement of a frenetic diplomatic activity to prepare the historic summit to be held by Washington and Pyongyang. During the visit, whose itinerary is unknown, the head of US diplomacy sought to finalize the details of the historic meeting to be held by US President Donald Trump and the North Korean leader, Kim Jong-un, and for the time being he has not set the place or the date. In addition, Pompeo met with the regime's inter-Korean relations leader, Kim Yong-chol, and took the opportunity to send the message that the two countries can resolve their conflict and put an end to the threats by "working together", according to the statements made by the American media that accompany him. The trip arrives; however, at a particularly sensitive moment after Trump announced yesterday that it cancels the nuclear agreement with Iran and that Washington will resume sanctions against Tehran in what some believe could be a declaration of intent for Pyongyang before the aforementioned summit. The Secretary of State himself told reporters on the plane that took him to North Korea that there is no intention of "easing sanctions" to the Kim Jong-un regime progressively. The head of the diplomacy said that the punishments will be lifted only when the goal repeatedly mentioned by Washington in recent weeks is achieved and highlighted again today by him: "the complete, verifiable and irreversible denuclearization" of Pyongyang. The message seems to insist on the hard line that Trump has supported with the designation of several "hawks" - among them Pompeo - since in March it was announced for the first time that there could be a summit with Kim, and suggesting that Washington could propose to Pyongyang an integral atomic disarmament like the one agreed in its day with the Libya of the dictator Muamar al Gaddafi. For what was collected by journalists traveling with Pompeo, between he and Kim Yong-chol all seemed good words. The two expressed their "hope" that Washington and Pyongyang can work to resolve their differences and Pompeo even praised Kim Yong-chol, whom he defined as a "great companion" with whom to work to finalize the summit between the leaders of both countries. However, the North Korean propaganda wanted to warn the US about the fragility of the current rapprochement, urging the Trump Government, in an editorial of the Rodong newspaper, not to harden the rhetoric so as not to "damage the exceptionally good atmosphere generated for the talks" between the two presidents. In his message on the social network, the US presidents added that the meeting between Pompeo and Kim was "good" and remarked that the place and the date have already been defined. So far, the White House has said that the meeting between Trump and Kim will occur in late May or early June and that several scenarios were being considered, including Singapore and the border between the two Koreas, for which Trump has expressed his preference.This historic meeting will be the first between the leaders of the United States and North Korea after almost 70 years of confrontation initiated with the Korean War (1950-1953) and more than a quarter of a century of failed negotiations. The gesture of Pyongyang not only smoothes the interview between both leaders but offers Trump a diplomatic triumph at a particularly tense moment. His decision to withdraw from the nuclear pact with Iran, announced on Tuesday, has unleashed a huge wave of international disapproval. Although muffled in the United States, where Iran plays the role of global Satan for large sectors of the right, these criticisms continue to erode the credibility of US diplomacy. But with the hostages in hand, Trump can divert attention and show that his conduct of negotiations with Pyongyang is on track. The three prisoners were the last Americans held by Kim Jong-un's regime. After the death of the university student Otto F. Warmbier, who was returned in terminal phase, they had become a critical point in the relations between both countries. They were an example of the brutality of tyranny that Kim Jong-un directs with an iron hand. All of them were arrested in the last two years under the accusation of espionage. Kim Dong-chul, a 62-year-old hotelier, was the longest behind bars. He was arrested in April 2016 for allegedly working for the South Korean intelligence service. In one of the denigration shows that the North Korean regime is so fond of, he was forced to appear before the cameras and confess his crimes. The second of the detainees is Kim Sand-duk, 50 years old. After imparting a month of classes at Pyongyang University of Science and Technology, he was arrested in April 2017 when he was leaving the country. The last to fall was Kim Hak-song, another teacher. He was arrested on May 6, 2017.